1. 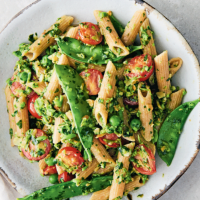 Cook the pasta in a large pan of water according to the pack instructions, adding 200g peas and the mangetout for the final 2 minutes. 2. Meanwhile, put the remaining peas in a bowl and cover with boiling water. Leave for 2 minutes, drain and place in a food processor along with 3 tbsp water, the garlic, oil, watercress and almonds. Season with plenty of freshly ground black pepper and blend to a coarse paste. 3. Reserving 6 tbsp of the cooking water, drain the pasta and peas into a colander. Add the tomatoes to the pan with the reserved water and cook over a high heat for 1 minute, stirring. Add the watercress pesto and stir for 30 seconds until thickened slightly. Remove from the heat and stir in the drained pasta, peas and mangetout. Cook’s tip Substitute semi-dried tomatoes for fresh tomatoes, and green beans for mangetout, if you prefer.